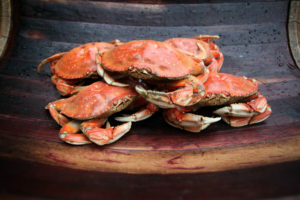 April in Astoria means it’s time for our award-winning Astoria Warrenton Crab, Seafood & Wine Festival at the Clatsop County Fair & Expo Center. Make plans to visit our corner of the Pacific Northwest for the 36th annual Festival, April 27-29, 2018. You’ll find all kinds of fresh Pacific seafood, Oregon wines, and a variety of our North Coast food products. Over 50 artisan vendors will offer designs in glass, wood, textiles, graphics, and more, plus jewelry and accessories, soaps and scents, and gifts for pets. You’ll find vendors almost from A to Z – artisan and gift items from Amazing Enterprises and Artistic Endeavors to Timbergrove Stained Glass and Unique Nite Lights. There will be food products from Blissful Wonders Chocolate to Whiskey Flats Gourmet Foods. The Festival lets you take a tasting tour Oregon’s wines without leaving Astoria. You’ll be able to sample wines from Oregon vineyards from the Columbia River Valley to the Rogue Valley and Southern Oregon, with a dozen or more from both the Willamette Valley and the Umpqua Valley. Bring your own wine glass, or purchase the official glass at the festival as a souvenir. You’ll sip and shop to live musical entertainment by local groups in the Exhibit Hall and near the Food Tent. The Astoria Rotary Club will serve fresh Dungeness crab dinners during the Festival. You can feast on a whole or half crab and several sides in the Exhibit Hall during all hours of the festival, and vendors will offer a variety of other seafood items as well. The Festival draws over 14,000 visitors each year, so don’t wait to book your weekend stay at Clementine’s Bed & Breakfast now! This entry was posted on Thursday, March 1st, 2018 at 5:26 pm and is filed under Clementine's Bed & Breakfast News, Events, Festivals, Food & Drink. You can follow any responses to this entry through the RSS 2.0 feed. Both comments and pings are currently closed.